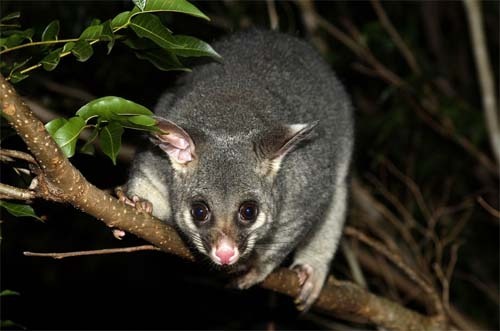 Being a green city with such a wonderful climate, Sydney is the perfect zone for possums populations the thrive. All areas of Sydney suffer from issues with possums needing removal. This is especially true for areas near the nature reserves and forrests that this beautiful city is renowned for. Due to problems with our favourite marsupial, our team of possum removal experts are always on call to help save you from these pesky little creatures. There’s an invader of a possum on the loose in Sydney and it’s making headlines. It may literally have been making the headlines while nobody was watching, for all anyone knows. There’s a lot a rogue can do in a newsroom when nobody else is there. A possum startled the staff in Sydney’s Channel 9 newsroom not so long ago, appearing from seemingly out of nowhere in an apparent attempt at getting some airtime. As it turns out Possums make terrible anchor people, and indeed, terrible people in general. Thus it’s generally understood that possums belong outside, and only people belong inside of the newsroom. Nonetheless this little guy somehow managed to get inside and derail the newsroom’s work for a while as they gave chase with brooms and cameras in hand in an attempt to herd it out of the building. Which they did, eventually. The animal intruder made the news and a few fans on social media from the stunt, which would be all well and good if things like this weren’t surprisingly common and becoming more so. If you search around, you’ll find stories of possums going into local shops and businesses, disrupting workers and customers alike. And you’re even more likely to hear about the animals disrupting people in their own gardens and homes! Precisely who are these creatures that are turning up with increasing frequency and why are they coming? What are the effects of their migration into Sydney and its surrounding areas? Exactly what should one do about it? Let’s explore the answers to these questions. Possums are nocturnal mammals that spend the greater part of their lives in trees and rear their young in the pouches on their abdomen. 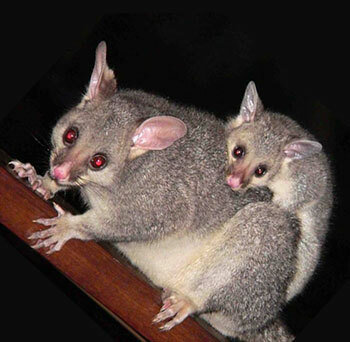 There are 69 known species of possums in the world, and a whole third (23) of those global species are native and unique to Australia. They range in size, from the biggest brushtail possum growing to over a meter in length to the smallest pygmy possum settling in at a tiny 70mm. However, the two most common species by far are the ringtail and the brushtail possums. Ringtails have soft, gray fur covering their approximately 30-35cm frame (excluding their tails, which would double their length), broken only by white patches behind the eyes. Creamy underbellies are common and their molars are noticeably sharp and pointed. Bushtails can come in a variety of different flavours, with colour patterns tending towards silver-gray, red, cream, brown or black. It has large, pointed ears, dark patches on the muzzle, and reddish stains on the chest from the scent glands they smear their territory with. These guys can grow up to 58cm with a tail length of up to 40cm. Their tails are the easiest way to distinguish the two from other animals and each other. Both possums have prehensile tails, which means that they can use them as third hands to grab onto branches and other things. The ringtail’s is coiled up when not in use (thus the name) and has a white mark at the end. The bushtail’s is bushy and black, with a hairless patch on the underside. Possums are naturally arboreal creatures. That is, they are tree dwelling creatures. So as trees are continually cleared out for the continuing spread of humanity and its projects, the space that these animals can inhabit gets smaller and smaller. Add to that the fact that possums are also extremely territorial (seriously, you cannot overestimate this) and you’ll find that they’ll feel forced to migrate. 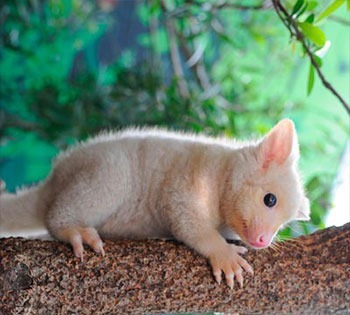 Now, while forested land in Australia is on the decline, the possum population is actually currently on the rise! Why is this? As it turns out, these tree dwelling animals don’t seem to mind the loss of forest very much. Indeed, in their eyes things may be better this way because of all of the human homes around. Not only is new housing abundant in people’s roofs and decks, but they’re accompanied by a seemingly unlimited food supply from our compost bins and our gardens. Much of Sydney has come to be split by a love/hate relationship for the possums that are turning up on the news and in the rooftops. On one hand, the little guys look nothing like the North American Opposum, which is decidedly nasty looking. Australia’s breeds are cuter by magnitudes. For that, and the fact that their migration into cities allows people a closer look at them, some enjoy having them around. On the other hand, there are a number of aspects of having a possum living in your roof, under your deck, or nearabouts your yard that leave many considering them pests and vermin. For instance, while possums may be nocturnal, human beings typically are not. If you have a possum living in your roof, you can expect to spend some sleepless nights wondering just what you did to deserve such an inconsiderate upstairs neighbour. They are decidedly vocal animals, with the more common of the two (the brushtails) being more loud. You will hear them scurrying around and calling out during the night, and you shouldn’t be surprised to hear the territorial guys fighting. If you start waking to unpleasant smells in your home, you may have a dead possum around somewhere, which smells nothing short of terrible. Alternatively, you may just be privy to the remnants of their urine and faeces, which preclude yellow stains in the ceilings and walls. They raze your garden of fruit, bark, certain leaves and flowers. They get into your compost bins (and take trash out) for food. They are becoming notorious for kitchen raids. If you have a dog or a cat, be sure to guard their food as well as your own. To top it off, besides the mites, fleas, and such they carry, their droppings may contain nasty bacteria (the buruli bacteria) that can cause skin ulcers in human beings. Having a Possum around, while perhaps interesting in its glimpse into nature, is a nuisance that’s better dealt with than not for many people. Which brings us to our last question. As it turns out, our homegrown possums are actually protected animals in Australia. It is 100% illegal in Sydney and all of NSW to trap one and remove them from your property without having a license to do so. The premier reason for this has its roots back to just how territorial possums are. Do you remember when I said that you couldn’t overstate how true this is? A Possum who has been taken too far away from its nest is likely to die trying to get back to its nest. Due to that, the easiest and safest method for all parties is simply to contact a licensed professional to handle the animal. No matter who does it, the entry points the possum is using to get into your home will have to be identified. These will need to be covered up once the possum is removed, to prevent it from getting back inside. The most recommended method for removal is creating a new nest for the possum on another tree at least 4m high. Guide it to take up residence in it by relocating its old nest to the new, leaving bright lights on in its current nest for 3 days and nights and using enticing fruit to lure it there. Afterwards, the entry points should be filled. If you find that the possum returns or you have a new roommate taking up residence, then there’s another entry point that has to be dealt with. From that point, you simply try the process again. That’s it! While it may take more effort, with the right tools and the right knowledge, there are ways to handle these unwanted houseguest without resorting to killing them. If you have a possum that is posing a risk to you or your family’s health and happiness in your Sydney home and you would like it legally and ethically removed, contact us for more information today.